The Latina Book Club welcomes children’s author Diana Lee Santamaria. As a child she struggled with reading so she understands the importance of literacy. As an educator she recognizes the need for more diverse books. Hence, the birth of DLee’s World – bright fun stories that engage young readers and expands their learning. GIVEAWAY! 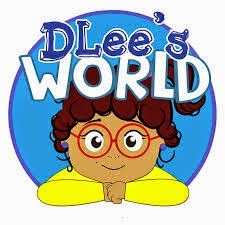 Please leave a comment below to win a free copy of DLee’s World. Yes, I do believe that there is a lack of books displaying diversity. Therefore it is my belief that as educators, we need to begin introducing books that have diverse characters with which children can relate. Growing up, I remember reading books and seeing characters in those books, which I felt did not look like me. So at times, it was hard for me to relate to them. I wondered why there were no characters that even remotely resembled my family or me. That idea sparked something in me and I decided that the characters in my stories would include people of all distinctions. Therefore as a children’s writer, I made sure to create a group of diverse characters in “DLee’s World,” to which all children can relate. As our population is getting more and more diverse, it is important to display that diversity throughout all forms of media including books - and with children’s books a great avenue to start. Q: Who is DLee and how did she come to be? DLee the character represents bits and pieces of me as a child and as an adult. DLee is a quirky and inquisitive preschooler who loves to learn and have fun. The name DLee derives from my own name Diana Lee. As a child, my mother always called me DLee and I decided to use the name because I think it is catchy, cute, and different. It just seemed so appropriate. Thanks Mom! When I wrote my first story, I was not quite sure who my character was going to be. But I did know that I wanted the character to represent someone who was different then the norm. Then I thought back to the way I looked as a child and figured that my childhood appearance would make a great character. Since I had a full face and large glasses, I experienced a lot of ridicule from children and even adults. Thus based on my own personal experiences, I wanted my character to represent that child who does look different; and I would hopefully demonstrate to children that it is okay to be divergent and also show children to be accepting of others no matter how they look. However, the difference between DLee and me is that as a child I was very shy and fearful of everything. It wasn’t till later in life, after enrolling in acting classes, that I was able to fully come out of my shell and become the “DLee” I always wanted to be. So I created a character that was the opposite of me as a child and more like me as an adult. As a result, I used DLee as an outlet to share my knowledge of early childhood education concepts and knowledge of children and their struggles inside and outside of the classroom to create my bright, bold, and fun preschool learning stories. Additionally, each character in DLee’s World has been created in the image of the people closest to me. For example, DLee’s mother, father and best friend were created in the images of my actual mother, father, and fiancé. Q: Does writing about personal experiences make the writing easier? I think incorporating personal experiences does make creating concepts of DLee’s World easier however it does not necessarily simplify the writing process. For example, I had a great story in mind that I wanted to write about DLee going to the zoo with her abuela and abuelo. Unfortunately, for some reason when I went to write the story it just wasn’t coming out right. Since, for now, all my stories incorporate rhymes, I was having trouble making the story fit the “DLee’s World” rhyme scheme, which can make the writing process a lot more difficult than you would think. Q: You have plotted 15 books in the DLee series. What kind of stories should we expect? Are there any plans to translate DLee's stories into Spanish? Yes, I am proud to say that I have already written a total of 15 DLee stories and I am always brainstorming new concepts for future books. Each of my stories touches upon different objectives that preschool teachers would use in early childhood classrooms. My books include concepts related to all educational domains social, emotional, cognitive, mathematics, literacy, language, science and so on. Resultantly, I have written books on color recognition, number and numeral recognition, new experiences like the first day of school, and moving, sharing, germs, being afraid of monsters, planting seeds, exploring caterpillars etc. I would love to one day be able to translate DLee’s stories into various languages including the Spanish language. I think translating my books would be a great opportunity to take DLee to the next level to allow all non-English speaking children to experience DLee’s World learning books. My stories have been created so that children can relate, learn, and have fun with literacy. However, they are also supposed to be useful resources or tools for parents, teachers and families of all diversities. Q: I noticed that your website offers a lesson plan and cue cards for each book. Can a schoolteacher use your books in the classroom or are they for personal reading only? Most definitely! My website does offer free lesson plans, cards or cutouts, and assessments for both parents and teachers to utilize. As a teacher, I wanted to make sure that my books were relevant to children as well as resourceful learning tools for both parents and educators to utilize at home or in the classroom. Therefore, I created lesson plans that coincide with each book that anyone can use to enhance the learning experience for each child or group of children reading my books. Q: Tell us about yourself and how teachers and parents can get a copy of your books. Also, give us your website and social network addresses. My name is Diana Lee Santamaria and I am a quirky, positive, creative, fun, and artist Hispanic woman who loves spending time with my family and friends, working and helping to teach children and most of all writing children’s books. I have been teaching for six years and I have a Master’s Degree in Early Childhood Education. I absolutely love working on my DLee’s World Series and cannot wait till early childhood children and educators everywhere are experiencing my bright, bold, fun learning books for themselves! DLee’s World books are available on paperback and kindle and can be found on www.createspace.com, www.dleesworld.com under the BUY NOW tab, www.amazon.com in addition to Funky Monkey Toys and Books in Greenvale, NY and Orion Toy Works in Delaware Water Gap, PA.